Thank you for grace… for not holding my past against me… for declaring me a new creation in Christ. Please help me to trust you with my past and with my future. Remember: my blog is not a monologue! It’s a dialog. I love hearing what’s on your heart and watching you love on and encourage one another in the comments. 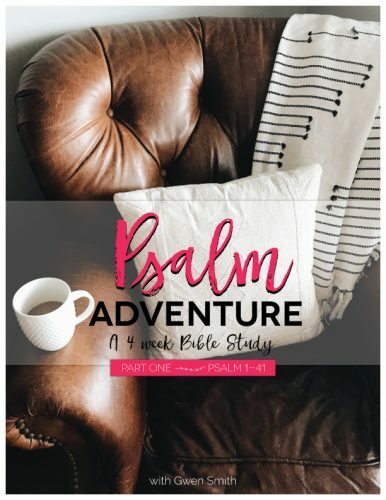 I’m hosting a FREE online Bible Study, a PSALM ADVENTURE, beginning September 9th. We’ve gotten countless messages asking how you can know what God says about forgiveness, healing, fear, depression, finances, relationships and hope. You want to know and trust God more, and learn how to connect your personal struggles to His promises. This was a very powerful read. I appreciate how real, frank and honest it is. It is very encouraging to be reminded that my ugly will not be held against me…that yes indeed, I have been redeemed from it all. 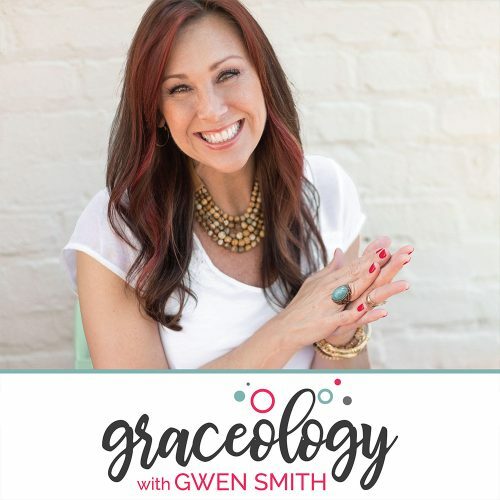 I thank God for how He uses you Gwen, to speak in easy to understand truth but with a deepness that goes beneath the surface. This article blessed me tremendously. To God be the Glory. Thanks, Patrice. That’s what it’s all about, girl. Yes! To GOD be the glory! These verses are yet another treasure to hide in my heart.. Thank you for your encouragement this morning! I needed to be reminded that Jesus background was messy, just like mine. I can hold my head up and yet walk humbly. Our God is just so amazing to take care of all of the details of our lives! Thank you ladies for reminding me that I am who am I and it’s ok . That I can speak up and not to be afraid. To stop second guessing Him. Thanks for the encouragement I needed!! Just prayed for you, Ariana!! I’ve been encouraged through many of your articles. I would like to request prayer for my fiance John and I. We got engaged in December 2017 after dating 3 years. We both have been through lots of healing and deliverance over our lives from past hurts and sin patterns. I have a hard time fully trusting any man after my past and because of my fiance past life. We both had been in very dysfunctional sexual endeavours. I had been married previously for 17 years. He’s older than me and never been married. We do ministry together at local Prison. I struggle with jealously also, due to previous ridiculous things that was throw up sometimes right in my face. My current fiance and I have not being sexually active and I hope to be someday. We just meant with our Pastor this week regarding some of these struggles. Our Pastor and his wife plan to continue meeting with us to try and get further healing and direction. Prayers for our continued growth and healing is greatly appreciated. For anyone out there dealing with the destruction of infidelity, DON’T GIVE UP! I will be the first to admit I didn’t believe God or anyone else when they said I would be rewarded with a stronger marriage for staying. I will also admit I didn’t stay and fight for myself or my husband but I fought for my grown son and my grandchildren. Life is hard enough but a broken family only makes it worse. Today I give all the glory to God my marriage is better and stronger than ever. It took 10 years to get here and I wanted to give up almost daily. It only takes faith and trust in GOD to move that mountain! Praying for God’s word to speak to our 5 children!!! They are not believers. I pray for them everyday! I struggle a LOT with my past, even though I KNOW God has forgiven me. And my struggles with things I shouldn’t be doing, praying for God’s strength! AND I’m praying I can get to the conference on October 6, in Michigan!! I LOVE me some GWEN!!!! Praying everything in Jesus name! AMEN! Thank you God for your grace and mercy. Thank you God for choosing me!! I have nothing to fear with you watching over me. You give me the strength I need and no one can come against me. Help me to remember that I am chosen, loved and protected. Thank you for this post!God is ever faithful and is reaching out to me. i went through a divorce 3 years ago and i have been struggling with bitterness and unforgiveness for all that i went through at the hands of my ex and his family….. God has just reminded me that He is there for me, i feel lonely and long for someone to love me amd my kids as i am…. God has just assured me that He has my back! God’s grace and mercy are enough! He has been faithful in protecting and defending me! His love never fails ❤️ I was in the right place at the right time tonight. God has a plan! I enjoyed today’s reading, thanks! A friend sent me a link to this and have never heard of Gwen before. I’m in New Zealand. I’d appreciate prayer as I’m struggling as a mother with teens. I’m so impatient and unloving in my responses to their ‘moods’ and they are disrespectful to me and each other. I need God’s peace in my home. Feel v defeated in this area but know God has them. The eldest is mot wanting to know God. It’s heartbreaking for me as a mum. Thanks for joining with me in praying for this. I am in awe of the fact that God has chosen me, He is with me and He will help me. So I will not be afraid. This devotion was a blessing to me. Learning to trust Our Heavenly Father to be there for me and with me and that he has my back and is taking care of His daughter when I am hurt and going through bad relationships. My need n pray is to let go and let God … I have not been able to do this for ever .. I am in recovery a step study with CR … My sponsor n I spoke about this very thing … Thank you my God continue to Bless you for Blessing me (us)!!! Thank you for this encouraging post. I’m writing a song about being more rahab than Sarah. Also, I’ve just finished writing my memoir about the same subject, having a painful past and finding grace in Jesus! Please pray I find an agent and publisher to get the book out there where it will glorify God and comfort others with the comfort I’ve been given. I know God is telling me to not be afraid he is with me. Right now I am still ashamed of my past and even afraid to enter my future. I have so much going on I just don’t know which way to turn sometimes. I am thankful for his love, grace and mercy. I know God loves me and he died for our sins. I will keep pressing on, because he’s not done with me yet. Thank you Jesus. Lord Jesus, thank you for cleaning up my murky past with your precious blood, thank you for forgiveness & new life in you. Lord, please help me to forgive myself and live in Your newness of life for me, amen. 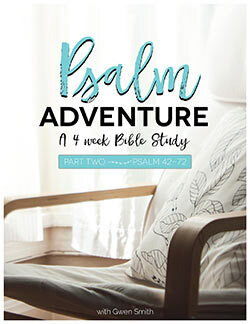 I LOVE my Girlfriends in God devotions, and I just began the Psalm Adventure. I am praying Isiaih 41 today for my friend and sister in Christ, Melissa, who is battling metastatic cancer. She just got the results of her tests yesterday and is praising God that she has been given a 75% chance of survival. She is continuing to pray for healing, and asking for prayers for her son Caleb and her husband Gary as they deal with her cancer. Please pray with me for Melissa. But you, Israel, my servant, Jacob, whom I have chosen, you descendants of Abraham my friend, I took you from the ends of the earth, from its farthest corners I called you I said, “You are my servant”, I have chosen you and have not rejected you. So do not fear, for I am with you. ; do not be dismayed, for I am you God. I will strengthen you and help you; I will uphold you with my righteous right hand. Thank you for that passage. (Isaiah 41:8-14) Tears immediately streamed down. I am reminded despite everything I am facing today He is with me and I should not fear. Please pray for me for closure from a very bad marriage and relationship with the father of my children. For this chapter to end soon and for me and my children to heal from everything we have been put through. And that I have strength to be what Christ created me to be, and be able to provide for my children’s needs. I have 3. Through it all I am stronger and closer to him than ever. So it was all worth it. For me to have joy and peace today. To be renewed starting today on my birthday. For my #34 to be the year where I start living with the purpose God created me for. To share the gospel to those who need it and need to have God in their life. To lead by example. Sorry that was more than one prayer request. This morning I will pray for all of you. Love you all in Christ, Karen. , I have subscribed but never went through with reading what made me read today I can only think God is reaching out to me. God knows I have struggled with my past for as long as I can remember. Shame and guilt has kept me from reaching out and following my savior. I am so glad I’ve read your reading today because it hit home so much. For years I’ve tried asking for forgiveness and at a point I have felt it and years later self doubt has set in and again I’m thinking of my past. I am glad I read today because I know God is trying to reach out to me. I want to thank God for all he has given me I really have been blessed. I am now asking for prayers for my health I have a bad cancer which every day brings me down, Dear Lord please help me and my family through this situation. I’m praying that the Lord will satisfy me fully with Himself; that instead of being drawn away from Him by my lusts, deep longings, loneliness and pain, I will abide in Him. Asking prayers for my son with type 1 diabetes. Hoping for a cure one day. As the bills build up, he struggles in making ends meet. Romans 4: 7 – 8 “ Blessed are they whose transgressions are forgiven, who sins are covered. Blessed is the one who whose sin the Lord never count against him or her. Romans 5 : 1. I am standing in God’ grace !!! I have been doing your devotionals for about a month now, and I thank you wholeheartedly for allowing God to work through you as the message is always what I need to hear. I am writing this response to request a prayer. I just began college a few weeks ago, and have been dealing with anxiety about the many changes. For about three years on and off I have been dating a boy who I truly love, but since school started I have been feeling kind of anxious towards our relationship. He assures me things are fine, I just think my anxiety is creeping into all aspects of my life. I just pray that he will be saved by the Lord. Thank you for every thing. I need prayer, please, for my sister’s heart to be softened to me; that the darkness of my past mistakes and the light that is now would draw her in. That she would feel less judged and more understood. That she would come to the alter to receive grace as well. Thank you for the encouragement. I needed that! I’m struggling hard in my faith walk right now. A combination of bad decisions, health issues and plain bad luck has led to me struggling financially. A couple of months ago, I felt God telling me to tithe 10% I’ve been tithing, but it’s been closer to 4-5%. But God told me to up it to where it belongs. I’ve wanted to tithe, but financially, it’s so tight, I didn’t feel like I could. I have some big bills coming due at the end of the year that I don’t know how I am going to pay them. I decided to go out on a leap of faith and tithe the 10% joyfully and willingly without resentment and pray that I can withstand this test of faith and grow from it. I still don’t know how I’m going to pay my bills. I’m still trying to figure out how to pay for everything this month, let alone the end of the year. I’m putting my faith into God that He will show me how it will happen. I’m reading and praying over Malachi 3:6-10. Every morning, I have a devotional with Girlfriends With God and every morning, I feel God speaking to me through you and the other ladies who provide the material for it. Thank you for helping me stay focused! Dear Father God, I need Your guidance, comfort, strength, and courage. I often fear to take even one step because I have made so many false ones. I feel Your presence this morning telling me to just take one step at a time. You’ll meet me where I am; You’ll guide my path; You’ll take hold of my right hand and say to me, “Do not fear; I will help you.” (Is. 41:13). Abba, most of all, I need You to heal my brokenness from the past. There is a great sadness that follows me all the days of my life and I need to replace that with joy and hope. I know You are loving me into Your kingdom, one step at a time. Provide me the forbearance to be patient, to “Wait on the Lord; be of good courage, and He shall strengthen your heart; wait; I say, on the Lord!” (Ps. 27:14). In Jesus’ Precious Name I pray these things. Amen. Please pray for my daughter who has ptsd. She needs prayers to move beyond her past. Hi. Just need a prayer for strength. I have a rough past and have been cheated on. My hurt, insecurity, and lack of trust from being cheated on, having my heart broken, and my world crushed in my past, is threatening to destroy my future. I pray that God can heal my heart and let the past be in the past. I am grateful for the wisdom I gained from that experience, but I don’t want that experience to define me or my current relationship. I want to have trust again and not let jealousy destroy my happiness. I feel the devil is on the attack and using this weakness against me. I pray that the man in my life has a pure heart and and that God will work in his heart to keep it pure and not let Satan attack him. This passage reminds me once again to not fear, for the Lord is with us always. Thank you, Lord, for being my strength and guiding me through life. Thank you God from delivering me from my past. I know I am forgiven for all the choices I made. Thank you for loving me inspite of. Help me to put my trust in you to know my past not hold me back any longer. Wow, this really hit home. I feel like I have done so much wrong in my past. But God forgives me. He gives us the strength to get us through each new day. I need to forget about the past. I need to keep looking forward. God is for me and not against me. As I go through each day, I can forget about what I have failed to do and start anew. I’m behind on all my reading so after I read Psalms 1 – 4 I read Colossians 1 and then when I got to work I was going to listen to the first Psalm Adventure video and take notes until I heard you mention checking my email for Psalm Adventure freebies (I like freebies) and when I did the first email I came to was, So You Have a Past and after a tearful prayer this morning I needed to read it and after I did it gave me hope for so many things. My prayer this morning was to be reconciled to my children, Carmen and Jeremiah whom I sinned against when I chose my own selfish way and abandoned them but God saw me and saw my struggle and is reminding me through this devotional He is my strength and my help. and my answer to your question Where do you sense He is leading you today? physically weak when the pain from spinal stenosis and scoliosis acts up and when I find out there’s further deterioration of the disc in my spine because He is and will be my strength. Now I’m getting ready to go home and on the way I gonna reflect and pray for God’s understanding of all I’ve read and heard today. God bless ya. Love ya, Later. Hey Susan, thank you for your kind words! I pray the Lord will bless your ministry and open the doors he has for you. If you’d like to inquire about booking me, you can follow this link: https://gwensmith.net/contact/#send-gwen-a-note Thanks! This post is SO inspiring. Members of my earthly family constantly like to remind me of my past. This passage/book helps remind me that no one should delight in reminding others of their faults. It also helped me t try and remember, more often, that God doesn’t hold onto my past so why should I let it bother me when others decide to do so? I wanted to say a prayer regarding Philippians 1 because the other blog post was deleted. Paul really inspires me through this book, and I wanted to share my thoughts with God about it publicly. I hope to be the type of person that people feel safe to go to in times of trouble (because they can see you in me.) Please instill in me the wisdom to know when to talk to others of your gracious love and miraculous victories. Also, I want people to know you, so I pray that more and more people will come to you each day and be able to find refuge in you! You are my only hope Lord, and I want to follow you for all the right reasons not “out of selfish ambition,” (as Paul mentioned) but because I want people to know about your majesty and unfailing love. Please give me the strength to know that you are always with me, even in times when others are slandering your name. I want other people to be able to see your virtues in me! After reading this I realize it’s ok to not be perfect. I have always disappointed myself by not setting higher standards for perfection as a mom. It’s hard. I have a special needs son who requires my attention 24/7 365! I have a daughter who often times I feel is left out. At night her and I lay in bed and pray about our upcoming day! Trying to make a change and be the light and non perfectionist that my kids need me to be. After reading this message and reading the scripture that went with it. I am Thankful to God for Him choosing and calling me to be a servant of His inspit my inperfections and feeling on unworthness. I have no reason not to continue to serve the True God who I know created heaven and earth. I know God is real because I am standing here on earth in which He created. Genesis 1:1-2. Inspired By God. Lord, thank You that You are with me always. Please help me trust You in this. Thank You for Your Word of Truth, and for devotional blogs such as this. 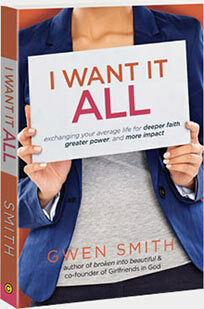 Thank You for Gwen’s passion for You, to reach women for Christ. In Jesus’ Name. Amen. I enjoyed the article on “Fallen Women” in the Bible and like the fact that you said that Jesus doesn’t ” sweep these women under the carpet” but helped them to repent and come into His Light! We all have pasts that are colored by greys and Jesus knows when we are sincere and want to come to HIM.PRAISE HIS HOLY NAME! Thank you, I needed to read that today, I’ve always enjoy reading your work, they are uplifting. You were the first person who greeted me, my first Sunday at life fellowship. God bless you, continue doing his work. The passage encourages all whose has their faith in God He will be by their side and hold their hand in all circumstances. I know at all times but I have times that God needs to remind that He is their when times are not going as smooth and I seem to feel lost in that circumstance. I do praise my Lord for His constant care and watch over me and my family where ever they are in their lives. As mother of grown children and ones who have their own lives I still their Mother and am concerned and pra for them everyday. I know my god watches over them no matter where they are and that can be many places over the world. God cares. Oh & Isaiah 41 was in my devotional reading titled “Fear Not” this morning… confirmation, Rhema word! Happy Tuesday(:… Wow, I am in awe of my Savior & Redeemer! His timing is perfect!! Yes, I have a past but God, His grace is greater than my pitiful past. Ta DA! My past has closed doors but God has opened a new door to the start of a teaching career that my past can’t close. Ta DA! Thank you Jesus for your grace and forgiveness when we simply and sincerely ask. And thank you for turning my past sin into a blessing. My life has been blessed so much more than I deserve. I love You and I thank you Jesus. Gwen, your messages touch my heart every time. God bless you and your family. Would it be possible to put the GIG devotional into print. I would definitely pay for a book of them. Fear not for I am with thee…. We can be as close to God as we choose to be because He never leaves us! Thank you, Father! Love you, Gwen! God bless you! Good Morning. Thank you for the newsletter today. I believe the Lord is sending me to learn so much more. I’m to begin a new job in 2 weeks. I pray everyday for this new journey. Isiah 41 8-14, lets me know God has gone ahead of me. Preparing the way, that I need not worry. He has taken care of it. May God be with you today and guide you on your journey. Bless you ! Blessings & Godspeed on your new job!! I too start a new job (career) soon… read Isaiah 41:8-14 as well this morning and was greatly encouraged by our Abba that He is already there, no need to fear. Making this scripture more personal, I insert my name instead of Israel, my servant, Jacob; or my family members. please pray for me had pins put in foot a few weeks ago and now 9am having a flare up of my lupus and fibromyalgia. I did my calling from him working with the homeless for 35 years and now I believe he wants me to take care of me but still help feed homeless once a month with my church and now do a lupus and fibromyalgia support group and do a gluten free blog. I am sorry to hear about your house. We had a similar event last year and were out of our house five months. I want to tell you about the blessings that came out of it for I truly believe God let it happen to give me better than I had before. What was soon going to need replacing, what was old and out dated are now new and beautiful. From Broken into Beautiful! It’s hard to keep a happy heart when these things happen, so I decided that if anyone started telling me how sorry they were for us, I would say “I think God had that storm come just for me so I could have a new roof, a freshly painted house, etc…, We are making lemonade out of lemons”. Truly I believe He will give you better than you had before. I am sure with your faith you believe that too. So this is my encourage meant to you as you encouraged me when you visited Callaway Gardens in Georgia for the First Baptist Church Ladies Retreat. I asked for a hug and you gladly gave it. I wanted to return the hug! I had a fixation on several men in my life & it’s hard to get rid of this “sin”. I was hurt by the men because I wouldn’t stop emailing them.The Lord helped me stop and I still ask him to stop. Please pray for me and the men I fixated on. I ask God to forgive me. Thank you so much for gig. I’ve been reading them every morning for years. This is a tough one, as many other women have posted as well. I see my sin as the worst sin a woman can commit. I don’t have the excuse that I didn’t know the Lord, that I didn’t know how deeply wrong it was nor was there circumstances that made the choice impossible. I was just scared, stupid and selfish. I believe with all of me that He is…everything that is wonderful, bright and beautiful He is. I am so abundantly blessed in a thousand ways and I see each of them as His love. I feel and am so unworthy. I live with the consequences now as I am alone. I struggle with shame and so often feel less valuable than other people. But I cling to Him every moment. I see the beauty in His creation. I do not understand very much at all but I believe and pray for a faith so bright I might show others His mercy and astounding, amazing, unfathomable love. Believing in what I do not see and certainty of what I hope for. Love, prayers and downpours of blessings. God will hold me with HIS righteous right hand. As I struggle with my own journey … Please pray that I hear God talking to me in his way …. As child who strayed from the Lord and is rekindling that relationship … I am ever so scared that I am ignoring him or not hearing his plan my life. Please pray for my family. We have been through 6 years of turmoil and distress. In 2010 we found out my husband has cancer and there is no cure. He lives in pain everyday, he is not working due to stress makes the cancer grow faster. I am the only on working and I drive and hour and a half to work. I am very stressed. I am praying for a job closer to home. And we need a financial miracle. I have been having health issues due to the stress. We need a miracle. Thank you Gwen for such a timely and much needed article. As always Abba knows what I need and when. I am currently in a season I want to end and the past keeps rearing its head but I know God loves me, always will and will never ever forsake me. I just have to be strong and remain in His strength and stop being afraid. I am His Daughter regardless of my messes and brokenness and I know He knows my Heart and how much I just want Him. God Bless us all as always. Thank you Gwen. Any verse relating to anxiety calms my heart and mind as this is a daily and minute by minute mental struggle for me. I appreciate your words and thoughts and they provide me great comfort ans power in the word of the Lord. Thank you! Gwen, so needed to read this today. It really hit the nail on the head for me. Lost husband of 49 years a year & a half ago & have been trying to find myself. Really hard to live & be alone. You are blessing. A friend named Fay shared Girlfriends in God with me a few weeks ago. Everyday at work I read Jesus is Calling and look forward to reading daily devotionals, so I started reading GIG too. 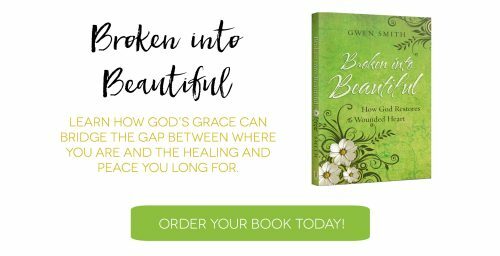 Gwen’s So You Have a Past must have been written for me, to me, straight from God. One of the hardest things for me to do is to forgive myself, which makes it difficult for me to forgive the people around me. I have ridiculously high expectations for myself that I often force on to others. The past month or so I have struggled, realizing I can be rather unlikeable and downright hateful. And it is taking a toll on me. How can I live the life God wants me to if I don’t even like myself? Reading Gwen’s words on the screen and attending mass this morning are like little miracles that happened for me today. I hope that I can interpret these miracles and move forward in a more loving and peaceful way. I want to recognize God more in my life. I want the people I care about to know that I love them unconditionally. I want to be a new creation! The WORDS “Do not be afraid,” are wtitten over and over by The Holy Spirit! The Lord Almighty, the All-Knowing, All-Present, All-Powerful One, Who created us- tells us time after time not to be afraid! He knows all and has authority over all, so the fact that He COMMANDS us, “Do not be afraid” should be a joyful comfort to our hearts! Hallelujah, Praise God! He is in control and if we let Him- He will take hold of your shaking hand…. 9 The heart is deceitful above all things and beyond cure. This messages was on time from my fellow sister to me this am Last night me my Daughters had a heated conservation about me as a mother i raised my children i was married for 17 years and 1/2 with my high school sweetheart gotten pregnant in high school 12th grade I graduated walked with my class my appearance full. and yes i have past and i wanted share this with you. because i needed it and i thank Our Heavenly father God and Isaiah 41: 8-14 Its for me personally. Yes, I am VERY interested in being a guest writer some time on any of your devotional websites(see devotional pdf attached please). My name is Amy Wallis Hood(posted my first devotional on my FB page today…TABLE FOR TWO PLEASE: LOOK UNDER MY FATHER’S NAME). In the past, I have posted many devotional type entry’s but today was the day to share the title(TABLE FOR TWO,…) I am working under. Blogging is on the radar but I am in the beginning stages of networking with writers and speakers, Christian leaders/businesses in surrounding communities, and praying for open doors. I have journal entries from the past 4 years where plenty of writing and speaking could originate from. I thank God I found your page. I’ve been dealing with so much. My husband left me early this year and I’m told he’ll be filing for a divorce next month and it’s all been too much for me to deal with. I pray everyday that God would restore my marriage. I truly believe he is my soulmate. We met in church but We’ve strayed away from God over the last couple years but him leaving has brought be back to God. It’s been a battle to trust God’s plan for my life and at times I feel like such a hypocrite even asking God for help. How can I? But you helped me see that God doesn’t see me as ugly he sees me as His child and knows my heart. Thank you so much for your insperational words. I pray God continue to use you for lost and confused souls like me. Thank you. This is an area where I sometimes struggle. Because of my past wrongs that led me to divorce and my praying for reconciliation, but meeting the rejection of my ex who remains in contact with me but does not want to put himself in that situation again. When I experience that earthly rejection, sometimes it overcomes me more than the grace I know God had given me and the joy I experience daily knowing I am saved and blessed to no longer be living the way I was. I wish my ex could know my heart. I wish I had the opportunity to show him I’m not who I was. And I wish I didn’t let discouragement surrounding that situation get me so down…I pray these things. I’m so thankful for devotionals like this one, friends who share them with me and all of the blessings God has been pouring out in my life…the greatest of those being softening my heart Day-by-day and making me more dependent and longing for him. Thank you for this devotion. I had surgery early Feb 1 and have grown so much closer to God. Today’s devotion was a much needed reminder that God uses the token to showcase his beauty. Thank you for your time spent helping others. I’m need pray for my sons to find jobs and bless them to be saved and I’m praying for restoration in my life .asking to help me in my business and ask God to help me in my walk with them. Gwen I thank God for giving you the gift of sharing his words with unperfect people like me, I have a past too very painful infact, but this scripture gives me the hope and lifts my spirit to know God see be on the brokenness and knows there is a good heart ready to serve Him. I thank you for your time to teach me that I am not alone and never was even in my darkest hours God was with me and lifted me and guided me through every bad situation I was ever in. Pray for me to keep me strong and focus on His word. This life has so many distraction from the evil one God help me to keep strong and always in your presence Lord Amen! Thank you Gwen for the words of encouragement today. God just knows what you need at the right time. He is Awesome! He is enough. I am sure that your writing and the timing of posting – I get your daily devotional in my e-mail – is not by accident! I have been working on writing my story, perhaps just for myself, and perhaps for others who might need to understand things that are true behind the scenes. Like the women God brought into the ancestry of Jesus, what a change in our thoughts of these amazing women we read of in the Old Testament! To see them in the place as God sees them – beyond the “historical” pasts that we might have only seen – well it changes everything about those dark and sordid stories, doesn’t it? That would be the reason for my writing, which will hopefully add, as a rainbow over my past – “But God…” Thanks for your timely encouragement! All I can say is this message came at a perfect time for me. You were truly inspired by God. Thank you! God says ” I AM is holding on to you. Don’t be afraid. ” God tells me “I got you”. Good thing. My grip is too weak. Thank you so much for your blog it is an amazing way to stsrt my mornings. When i read Isaiah 41:8-14 it gives me a scene of peace to know that Jesuse is with use no matter our situation or what we might be going through. It assures us to not fear for he is there to help us. Thsnk you again. Thank you for these beautiful words of encouragement. God still loves us beyond and through the muck and mire of our lives! Praise God for a fresh start! Thank you Jesus for your grace, mercy and unfailing love! This came right on time! My best friend shared this with me today as we were just talking about this very same topic yesterday. God works in mysterious way!!! This was so heart felt…..Thank you for today’s inspirational message! I’m So thankful for the devotionals you post. They speak to my heart daily. It’s been a very difficult journey through repeated rejection, so it’s very comforting to find comfort somewhere in this journey. Your posts are always so inspiring. I’m always so amazed at how well they fit into whatever is going on in my life at the moment! Thank you so much for sharing your thoughts with me, everyday. It really does do wonders for my heart. Please help me to remember what I read in Isaiah today, that I shall not fear because you are my God and you are with me. I strive to know your peace, Lord. Allow me to place all my worries in your hands, Father, just as you have told me to do. I long to trust you more, I long to trust you in the way that I know I should, Lord. I know that with you by my side, I don’t have to feel so afraid all the time! Lord, help me remember that- especially today, as I bring my baby into the doctor for her follow up appointment. Lord, I pray with all my heart for her health- and with all my heart that I can conquer the anxiety that sets in whenever I have to take her in. God, help me ignore the whispers of the enemy, who is constantly trying to keep me afraid and whispers terrifying thoughts. I pray to stay focused on you, so that your voice is the only I hear. Thank you, God for letting me lay all my worries at your feet. Please, if everyone could pray for my daughter, Siefer, it would be so appreciated. Thank you so much. I prayed that you would see God showing up strong on your behalf. This “new” person is a heart patient and I’ve struggled since December with illness: virus, a cold, etc. I am asking for prayer please to help me regain my health. I am asking for prayer for our National Day of Prayer Community Prayer Breakfast (held on May 4) because my illness keeps me from the tasks and chores I need to be accomplishing. I am asking for prayer so I can get back to the gym & exercising, as I should, for my health’s sake. I know the inner woman has been renewed and I rejoice in that truth and blessing. But, right now, the outer woman has too much illness on her plate and she desperately needs some relief. Thank you. Blessings. I have done many wrong things in my long life and have hurt many people. Sometimes I feel as if I am being punished now for these things. Everything was always rather easy in my life. Then everything happened in a relatively short time – I lost my Father and Mother. Then my bipolar brother became manipulative and verbally abusive. Then the Lord took my beloved husband unexpectedly and I went into a yearlong “black hole” of grief. Then my son became addicted to drugs (there had been problems for years but not to this extent) and after “helping” him for a year to the tune of $25,000, I finally realized all his excuses were lies, I stopped being his bank. So I haven’t heard frim my son in a year. My brother has “disowned” me through Facebook. I am holding on by a thread. I know God loves me but sometimes, if I think about everything, I don’t know how to cope. My heart is heavy. Thanks Jesús for your mercy and grace even though I do have a passed you are my present, my protector, who is with me all the time. I worship Your name. Jesús has change my name from nobody to his daughter, to his princess, God everything is yours even my worship. You are God almighty! My past is not really a bad past, I was raised as a Christian, thank you Lord for my parents, I am 71 and the lord has been so good to me. I have had my ups and downs like everyone else. I am here to ask for special prayer for my grandson Daniel. He is 15, need I say more? He knows everything and has a smart mouth to his mom. He was raised as a Christian also, but I have a feeling the pear pressure is getting to him. His grandfather died when he was 8, they were best friends and I don’t think he has really gotten over it. He has so much bitterness inside of him. Please pray that our Loving God will take the bitterness out and he can once again be our little man. I love this child so much, I don’t want to loose him. Thank you. I enjoy your GIG devotional every day. Hi, I want to thank you for these messages. I have so much trouble being able to read the bible,it seems to just go over my head and I can’t retain much of what I read….these I can read and re-read and understand….Thanks so very much…I ask please if you could keep my daughter(mentally challenged) in your prayers. My husband and I have to make a big decision of moving her to another group home…I am struggling bad with this move….I have ask God to show me the way ,but I feel the more help in prayers I will know God’s answer….again thank you for the beautiful work you do…. Love this verse! I too have been struggling to accept my new self after having surgery in December. It has changed me so much! Thank you for this reminder. Praise God in Jesus name Amen! Thank-you for your devotionals, I read them every morning, and send them to my sister and friends. I love the work your are doing, and you inspire me to live for Christ. Please pray that He continues to renew my spirit as I strive to please Him. Good morning! I share the devotionals as well with my girlfriends in God. Isn’t that a delightfully wonderful way to begin the day? Blessings. I read your book. It is awesome and inspiring. Thanks for the inspiring words and encouragement. I call it a blessing sent from God. Wow! What a great message today. We all have a past and with God’s grace and love we can let it go. I’m currently working through a separation and inevitable divorce from my husband of 7 years and best friend of 13 years. He decided he doesn’t love me like a husband should love his wife and had an affair. He continues to see this woman. It breaks my heart. I ask God for strength and courage to heal my heart and lead me where I’m to go. As long as God is by my side I will get through this a stronger and better person. God bless all of you! He loves us even when we don’t love ourselves. Thank you Gwen. And thank you Lord for letting me find this blog. I am trying to get through a divorce from a man I thought I knew. Deep down underneath his shallow skin, I see the person God meant him to be, so it is difficult to let go of my love for him, even though he has continuously been unfaithful. God showed ne that I needed to let him go. So I have, but the grief is overwhelming. As we all know, the love and committment doesn’t go away with a piece of paper. God, now that you’ve shown me what was going on in my marriage, please show me the way to a life filled with joy. Thank you so much, Gwen, I am broken, 68, and just want this all consuming feeling of “I don’t know who I am, or where to go” burden to be lifted. Amen. I could have written what you just did. “I see the person God meant him to be” is so haunting! Thanks for sharing this part of you heart. I don’t know what to do with that issue in my life either, especially when our Soul Enemy adds – “it’s all your fault!…” And, BTW, I was 68 when I divorced. I know this – our pain is our own, but you are not alone in what you feel. Sometimes I just have to ask God to remind me of the “why” of my need to divorce my husband. It is so important, not in order to dwell on his sinfulness, but our image of the person God meant him to be can be “crazy-making.” So skewed by sin! Every day, I have to say – “Let go, Joanne. Just let go” – and God picks up that burden for me. He will for you, too! And – your Daddy God knows who you are, and where you are going! I feel that God is leading me to facilitate a book study for the women of my church. I’m going to use your book, I Want It All as our first study. I thank you for the materials you’ve provided to support the book. I am so anxious to get started after the lenton season. I hope to reach more young women in need and am prayerfully considering how to find and encourage them to join me in learning and faith. Your devotionals always speak to me heart – Thank you! I was saved at age 11. So, how could I have done what I did???? I cheated on my first husband, divorced him, then proceeded to have an affair with a married man and lived in a very promiscuous way for several years. God gave me another chance – I remarried, and we have wonderful children and grandchildren. However, I cannot forgive myself for what I did in my younger days. I wonder if every tribulation that my children endure is a result of MY sin. I doubt my initial salvation, although it was a very real experience. Thank you for your encouraging words. I guess, even at my age, I’m a work in progress. My heart grieved when I saw the name you gave yourself – “Shameful.” Did you see that attached to any of the women’s names in Matthew’s list? NO! Instead, I could just imagine God’s joy as he placed those names in his Ancestry. “look at this jewel! – Tamar! And her – Rahab! And you, Bathsheba! 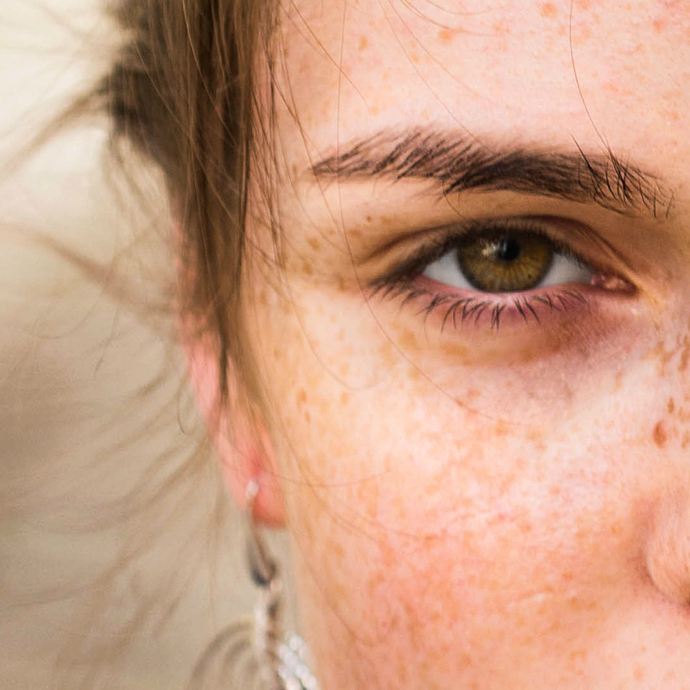 Your stories as told in your day would label you “shameful,” but when I think of you, I am dazzled by your beauty, the beauty that came to you because I love you!” You, too, sister, are one of God’s precious jewels, beautiful, priceless. I know about shame. In fact, I continue to struggle with it. Raised in a Christian home by a very angry father, who I believe I will see again in heaven, molested by my brothers, married and divorced twice. 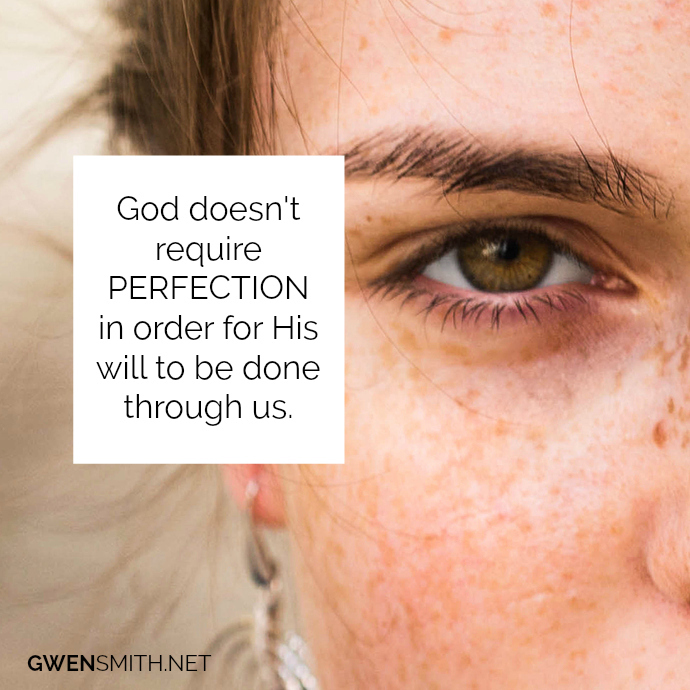 Constantly being challenged by – “if only you could have been perfect…” This devotional was written just for me as well as for so many of my sisters in Jesus. I would like to see the new name you give yourself! Thank you so much for caring. Your message meant so much to me, and it took 10 minutes for me to stop crying. New name: Forgiven. Much love & blessings to you, Joanne. Yes – Forgiven! That is who you are, what you are, my dear sister! I love you, even though I don’t yet know you! And when that sly enemy of your soul slinks around whispering “shameful!! !” you just remind him that NO! You are forgiven! And made whole, and perfect in Jesus. Thank you Lord for choosing us in spite of us. May you continually seek your guidance, strength, direction as chosen vessels. Hello Gwen! My name is LaTasha, I’m from Michigan but resides in Indiana. I thank you for this message. I’ve been struggling to let go of past hurt, pain and rejection from my father leaving my life at an early age. I love my dad and in getting closer to Jesus I notice that I still have a seed of anger and bitterness and rejection that I am trying to overcome by the strength of Christ. Also the same feelings but towards my daughters father. I think knowing the pain of my dad’s absence is a source of my anger and bitterness towards her father as well. I’m praying daily and I will overcome. Will you please pray with me. Thank you in advance. Thank you, thank you, thank you! I am just beginning by journey with Christ and feel his spirit growing within me daily. Your kind words fill me with hope and help me to see my past mistakes as stepping stones to a more glorious future! I know he was a weasel, a rascally heel grabber. Thank you Gwen, for bringing out God’s word today more clearly. I believe that I am a new creation and I also believe that God is faithful to His words and even His words in Isaiah 41:8-16. This post has really encouraged me. I’ve been living in shame and condemnation from my past sins. I have done things before my salvation that I am truly ashamed of and I am trying to trust God with them and let them go. I have repented and asked for forgiveness over and over again and It seems like everytime I really begin to allow myself to feel accepted and loved by God, the enemy brings those painful memories. I know that my Saviour has redeemed me and that I am His child, I truly believe that my sins were paid for by Him on the cross. I pray that I stop believing the lies of the enemy and allow myself to walk in the forgiveness that Christ has provided for me and to leave my guilt and shame with Him. God bless you so much for the light that you bring into our lives. I to have had a past that I’m not proud of someone told me that I need to forgive myself. I’d given my past to God but kept allowing the devil to make me ashamed of the things I’ve done. Now I share my past with women God tells me to. Thanks today for this beautiful post I’m just so hard on my self for not letting go of my past sins. Why! Even though I’m R C and confessed many times .Please reply God bless. Thank you so much Gwen for all your posts I’m so hard on myself I just can’t let go of my pasted sins even though being a Catholic confessed can you please reply thank you . Wow! This study is already reaching directly into the deepest and emptiest parts of my broken and hurting heart! Same as some of you have mentioned, I have been going around and around the same dreaded mountain for close to 3 years now trying desperately to get past my past and from all of its unexpected and devastating things done to me, like you mentioned “that were beyond my control”. My 20 yr marriage to my best friend in the whole world came to its demise as a result of an online affair, and quite soon after, became his new wife. I beg God every day to please help me get this man out of my mind and out of my heart! I’m so tired of grieving; of being sad; and at 52 yrs old…tired of being lonely. I ask God to heal my brokenness from betrayal, deceit, abandonment, rejection….the list goes on and on! I want to get past my past! I want ALL of Jesus!! I want to be fully committed to following Him completely aware and fully knowing that following Him will GIVE me everything and COST me everything! I’m ready to give Him ALL of me in order to know and have ALL of Him! I’m so looking forward to growing and healing with all of you, and so appreciate you, Gwen, for your teaching, your wisdom, your time devoted to this study and to helping all of us grow and heal! Oh, Patty. I’m sorry for the pain you’ve endured. Truly. Grieving is surely a process. But HEALING is God’s plan and I fully expect that this I WANT IT ALL journey is going to take you to new heights of healthy and whole that you can scarcely imagine. Because JESUS is all about life – abundant life – in spite of our challenges. Please keep me updated as you go through the study! I love your blogs and am currently reading your book! LOVE it. I plan on sharing this tonight with my REFIT® group during our heartwork time! I particularly love this devotion for the same reason I love David in the Bible. He made mistakes…A LOT…but he knew the power of prayer/repentance and was still considered a man after God’s own heart! Keep up the good work of counsellin and sending words of encouragement to the broken hearts. Thank you Gwen for continuing to stir something in me when I read your words. I reply to you and I pray for healing and strength to keep moving forward. I have been wanting to get your book, Broken into Beautiful, for a while now. On my list (long ?) of things to do. I want to get it off your site. A signed copy. I have been Broken. Continue to be but hope and trust into beautiful. May we continue to grow in the strength of God’s love ❤. Thank you so much for this word of encouragement, as I was reading this devotion this morning, thoughts of things of my pasts tired to attact my mind but I thank God for upholding me with His righteous right hand! Thank you for a great devotion today! This is exactly what I needed to hear too. It’s so hard sometimes to forget the past right? I have to be reminded of who God is and who “He” says I am! I focus sometimes on “thinking things through” to “work on” things from past. This is what I have been taught my whole life in secular counseling. I was always taught to “process” things, “analyze”, find out where “things come from”, “look at your behavior and where you came from”. This was absolutely exhausting! When I answered the door, when Jesus was knocking, I had to learn a new way. When I’ve got something reflecting from past I have to take it to the Lord and ask, “is this something you’re showing me to look at, to bring to you?” Or “do I need to rest in what scripture says?” I have to continue to read scripture so my brain gets retrained to know it’s not about my “feelings”, it’s about His truth! Sometimes the thought to “process” what I’m feeling really seems “real”, like the truth! Most of the time it’s a lie! Sometimes the hardest thing is to wait for Him to discern, trust and rest in Him. So thankful for this word from you and the Lord today. I have been at war in my mind for a few days now, dealing (again) with my broken past. Just knowing that God has never forsaken me and is holding my hand today is such a healing thought. Don’t even fight that battle, Terry. It’s ALREADY WON! Like Jesus said, “It is finished.” Be free. Once confessed, sin is not ours to hold on to. Have a beautiful day in HIS grace, friend. I am tired of looking at myself and seeing all I am not. Help me to turn my focus on you, my healer, my redeemer. Lord you are awesome, you do wonderful things for your daughters. I have to refocus on you! My life is nothing compared to what Christ’s life did for me. Be with me today, be my focus and my delight. Yes and amen, Doreen. Yes and amen. Thank you Gwen…. I am so hard on myself for mistakes from my past and struggle to do right all the time now…. But you remind me that God looks at my heart and knows how hard I try…. And when I fail He picks me up dusts me off and says try again. I will keep trying and forgiving myself because He forgives me…. But I need these reminders that I am not alone….. If I help others with this….I help God!!! Blessings Gwen….. And thank you for being God’s messenger ? Thank you Gwen for your devotion and books you write!! It helps me live for God the right way!! You are truly a blessing to me!! Praying that God will bless you as you help people live for God in amazing ways!! Love you !! It is my joy, Joyce! Thanks for the encouragement!